“Good character is more to be praised than outstanding talent. Most talents are to some extent a gift. Good character, by contrast, is not given to us. As boys continue their emotional, intellectual, spiritual and social development through adolescence, their understanding of morality grows as well… and their behavior becomes more closely aligned with their values and beliefs. Understanding the importance of these values, and trying to live by them, provides boys with a ‘MORAL COMPASS’ that can help them to make good life decisions… “to discover what is real and true about themselves and the world around them”. This is one of the important tasks of the middle school years. 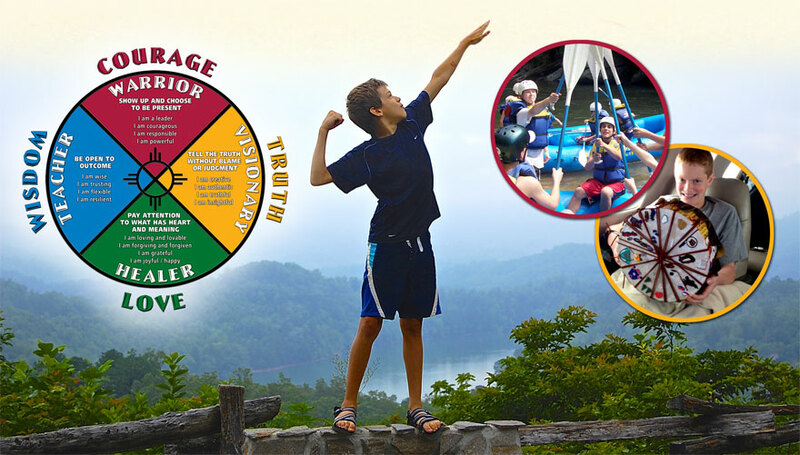 Cherokee Creek offers a strong character education curriculum that permeates the entire culture of the school. The Medicine Wheel – created by cultural anthropologist Angeles Arrien and introduced in her book The Four Fold Way – provides the framework for our character education. Based on decades of research, this model conveys “perennial wisdom” – values, beliefs and themes that are shared and expressed by at least 85% of the cultures of the world. With permission from Dr. Arrien, we added elements to the wheel to make learning relevant and age appropriate. Known as “The Path” to the boys, this curriculum breathes life into the many lessons inherent in the Medicine Wheel. We help boys discover the meaning and actions of COURAGE, LOVE, TRUTH and WISDOM to build a life of balance, harmony and character.